Celebrating the life of Miguel Quezada, Jr.
Be the first to share your favorite memory, photo or story of Miguel. This memorial page is dedicated for family, friends and future generations to celebrate the life of their loved one. 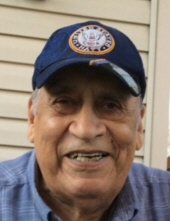 Obituary for Miguel Quezada, Jr.
Miguel Quezada, Jr., age 92 of Southfield, passed away Tuesday, March 26, 2019 at the John D. Dingell VA Medical Center, Detroit. He was born April 17, 1926 in Detroit to Miguel and Maria Luisa Quezada. Mr. Quezada served his country proudly in the US Navy during World War II. He received the Asiatic Pacific Ribbon (Two Stars), Philippine Liberation Ribbon (One Star), American Area Ribbon, and the World War II Victory Medal for his service. He was a man of faith and family and will be missed greatly. He is survived by his wife of 70 years, Virginia, whom he married April 16, 1948 in Detroit; his children, Alicia (Jack) Duncan, Marta Bozymowski, Julia (Robert Ptasznik) Quezada, Elena Quezada, Victoria (Kevin) Schlau, and Daniel (Linda) Quezada; brother, Raymond Quezada; sister-in-law, Olga Quezada; 14 grandchildren; and 20 great grandchildren. Preceding him in death are his parents; his son, Miguel Quezada, III; and siblings, Carlos, Roman, and Elena. The family will receive friends Sunday 3:00 PM until 8:00 PM with a 6 PM Scripture Service at the Sawyer-Fuller Funeral Home, 2125 12 Mile Road, Berkley (two blocks west of Woodward Avenue). Mr. Quezada will lie in state Monday from 9:30 AM until the time of Mass 10:00 AM at the National Shrine of the Little Flower Basilica, 2100 12 Mile Road, Royal Oak (northwest corner of 12 Mile and Woodward Avenue). Private Burial at Great Lakes National Cemetery, Holly. To send flowers or a remembrance gift to the family of Miguel Quezada, Jr., please visit our Tribute Store. There will be a Scripture Service at 6 PM. Mr. Quezada will lie in state from 9:30 AM until the time of Mass. "Email Address" would like to share the life celebration of Miguel Quezada, Jr.. Click on the "link" to go to share a favorite memory or leave a condolence message for the family.